Has anyone here ever heard of 'Panosteitis' or has any experience with it? Is it hereditary or related to poor diet + stress? Pano is commonly known as growing pains, usually occurs in quick growing puppies between the age of 6-18 months, they will recover/grow out of the condition but just need to have patience, rest is required during periods of lameness which can shift from leg to leg, a lower protein diet is recommended to slow growth rate, not thought to be hereditary. it is caused by inflammation of the long (leg) bones during periods of rapid growth. as carol says, they grow out of it. there are differing opinions on whether to provide pain relief. 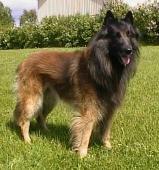 i would avoid use of steroids like bute, and consider use of buffered aspirin, depending on severity of dog's pain. Dr. Ian Billinghurst, of Give Your Dog A Bone fame, suggests that a processed food diet contributes to Panosteitis, as it causes the dog to grow at too rapid a pace, as others here have mentioned. He suggests keeping puppies growing slow and lean on a raw natural diet, including the use of raw meaty bones,(RMB) like chicken backs and necks. He also attributes other skeletal deformities, including poor shoulder, elbow, hip and jaw development to the lack of vigorous chewing of RMBs by puppies, where they use their entire bodies to eat their food! Okay, I came across a Dog Owners post (different Site), which would suggest that BARF diet vs. Conventional Kibble has little if anything to do with it, as she once owned one dog who had a very severe case of Pano, while the other dog only just recently developed the first symptoms, and both where fed the BARF diet! As far as diet goes, Dr. Billinghurst says that "heat damaged polyunsaturated fats" might be a "trigger" for Pano, and that diet and exercise play the biggest part in dogs that may have a predisposition to developing it. The biggest, most critical piece of Dr. Billinghurst's beliefs are based on a percentage of Raw Meaty Bones (RMB)and he recommends 60% RMB for puppies. Some people use just meat without the bones, which isn't the same. He recommends letting puppies play until they're tired, and not taking them on long walks, as it puts unnatural stress on the skeleton. I personally have never raised a puppy from weaning to adult on BARF, using RMB, but I know someone who is currently doing it religiously, and the puppy is almost seven months old. So far, so good. A word of caution about RMB/BARF diets. Dogs can & do become very ill--so as to threaten life--on this regimen. A detailed internet search on "panosteitis" will yield direct veterinary information. What kind of threatening illnesses do you mean? Dogs get sick from lots of things, but I personally believe that dogs, the same as humans benefit from a fresh, natural diet, which strengthens the immune system. Dogs drink out of gutters and toilets, eat faeces, and turn around and lick their own wounds! There are rare occcasions when a bone gets stuck at one end or the other, but it's never happened to my dogs, or any of my friends' dogs. I know of one little puppy who became constipated temporarily. Veterinarians are pretty good at diagnosing Pano and prescribing medication for it, but how do they advise NOT to develop Pano in the first place? They make their money selling kibble and specialized diets AFTER the dog has already developed kidney, heart, skin, skeletal diseases, etc. Dogs got along pretty well eating as wolves, hyenas, and foxes. The management of Pano is up to the breeder/owner. IMO, the benefits outweigh possible risk. I've seen many GSD's with pano, some so bad in all four legs they could barely walk. I disagree about not being hereditary, I have seen it in littermates, parents and progeny, half siblings, etc. The best thing you can do is keep them quiet.